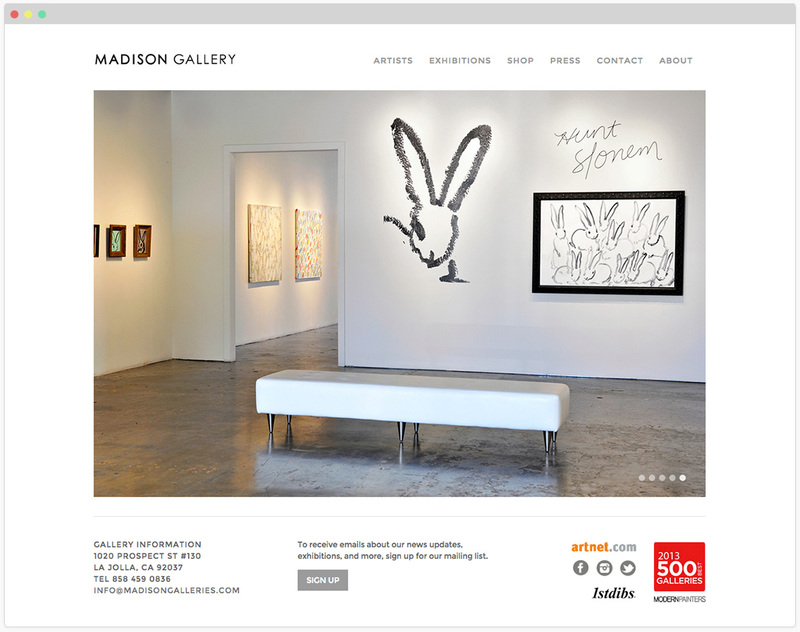 Madison Gallery is a 10,000 square foot contemporary art gallery in La Jolla, California boasting an impressive roster of world-renowned artists and several A-list clients. When I first met the owner in 2012, the current website did not reflect the impressive stature of the physical gallery space or the artists and clientele that frequented it. 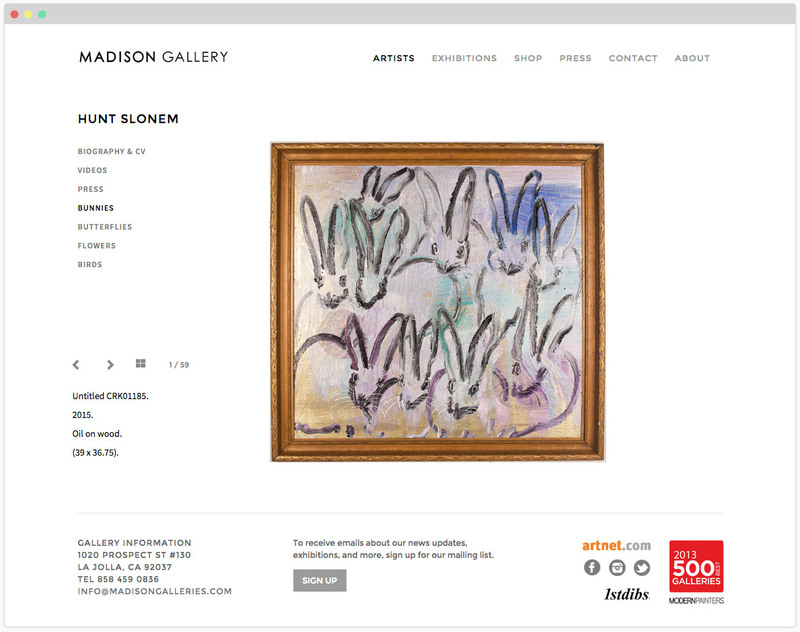 Due to the increasing presence of the art world online, it was clear that the website needed a face-lift. 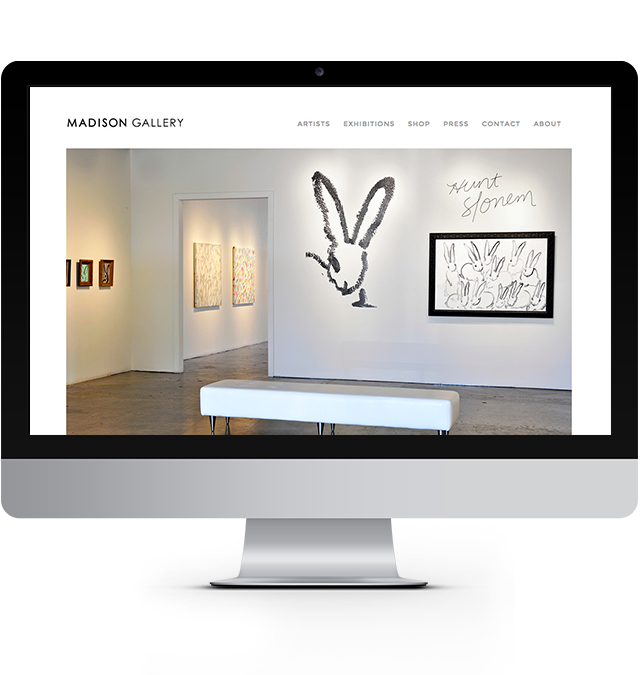 The main goal of the redesign was to create a very minimal and clean design that showcased the artwork of the gallery’s represented artists. Additionally, the website had to be extremely easy to use and quick to find relevant information, always putting first the user experience of current and prospective clients and collectors. Once the website redesign was complete and saw such a positive response, other branding and collateral naturally followed. With clientele from around the world and many competing galleries, having a strong and recognizable brand is invaluable. 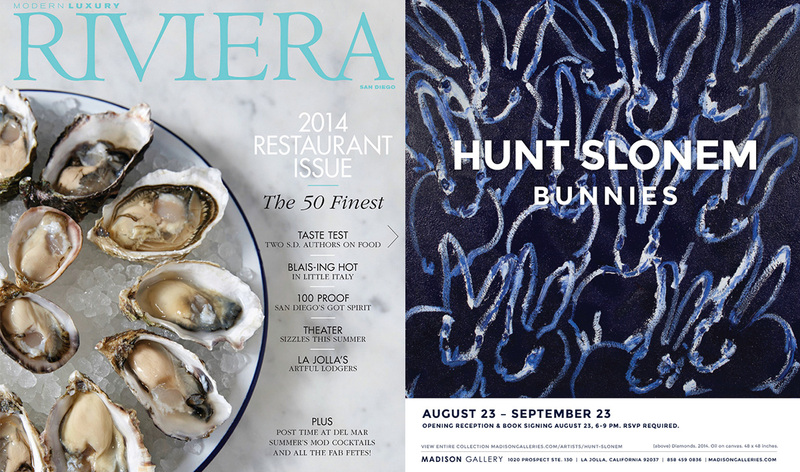 I was tasked to design advertisements (in publications such as Modern Painters and ArtNews), exhibition invitations, and email marketing on at least a monthly basis. 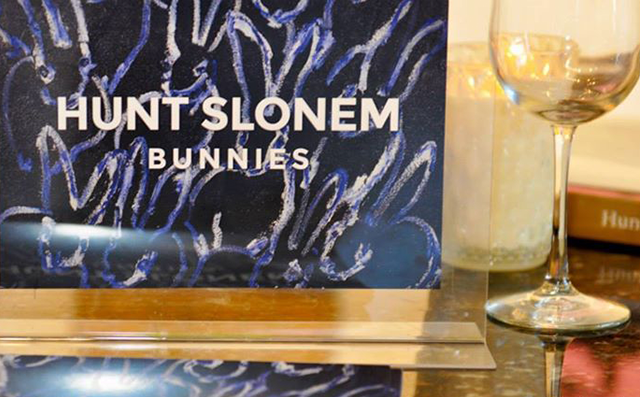 Keeping within the overall Madison Gallery branding, I began designing sub-brands for special exhibitions (such as the Hunt Slonem “Bunnies” exhibition as displayed throughout this case study). With works only on view for a short period of time, a successful opening can boost sales and make the difference of a successful exhibition. 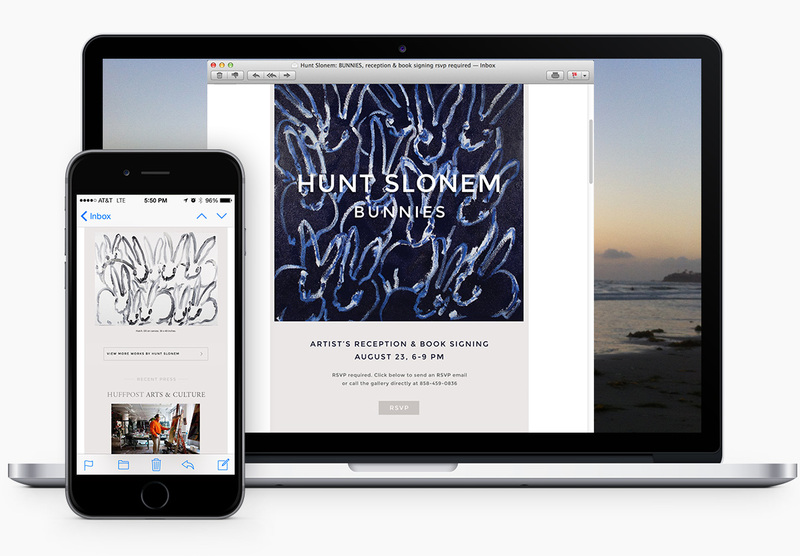 One of the fastest and easiest ways to engage the gallery’s clients is through email marketing. With the new website came the ability for users to join the mailing list and has resulted in thousands more addresses added to the distribution list. 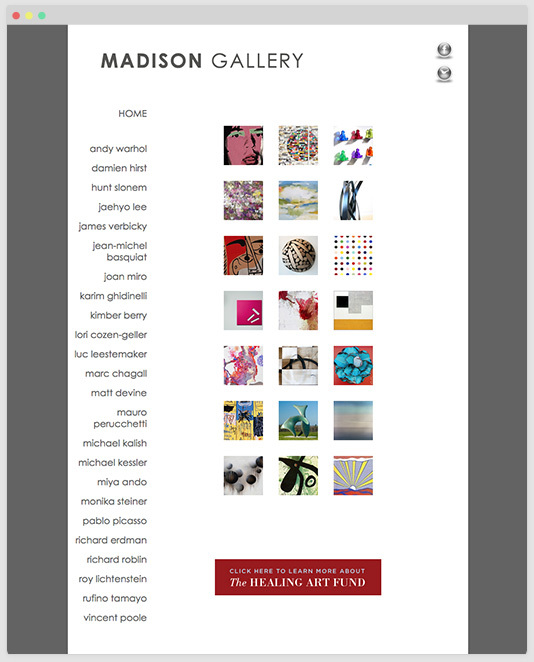 With a focus on imagery and a clear call-to-action, the email open rate increased and the gallery received more RSVP’s for exhibition opening receptions. 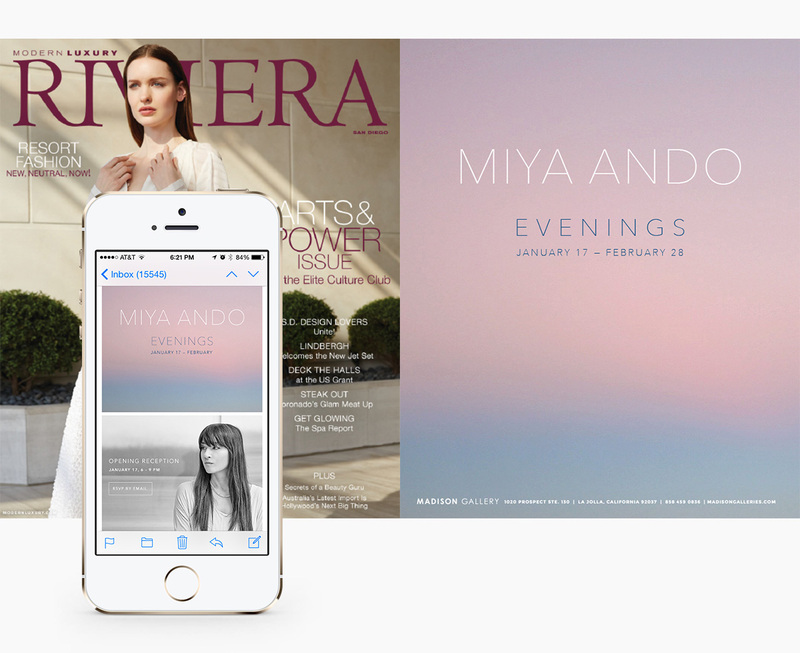 From email, to advertisements, to mailed and distributed invitations, consistent exhibition branding ensures that clients and visitors have a constant reminder of the upcoming exhibition which helps to generate buzz around the event. The works featured within the exhibition branding often sold on opening night.